What causes corrosion? Seawater is a good conductor and freshwater a bad conductor, so corrosion is worse in seawater. Generally, corrosion rates increase in proportion to the amount of oxygen in the water. However, cracks and crevices, which are areas starved of oxygen, become anodic and corrode also. Higher temperature increases corrosion rates - doubling for every 30 degrees C (55 degrees F). There are various types of microorganisms that can contribute to corrosion, either by removing protection or causing a corrosive environment. Why do I need anodes? You need anodes on your engine because when two different metals are in contact, electrons will flow from the more negatively charged metal (anode) to the more positive metal (cathode). If you want to protect both types of metal from corrosion, you must add a third metal such as zinc, although magnesium and aluminum are also used. This active metal becomes the anode for both metals. The zinc or aluminum sacrifices itself to protect the other two metals, hence the term "sacrificial anode". Throughout the world you may find many different water environments which may all require different solutions. The three main water types are salt, fresh and brackish. Martyr™ zinc and aluminum anodes protect very well in salt and brackish waters where magnesium anodes protect the best in fresh water. DO NOT MIX Zinc and Aluminum Anodes on the same vessel. It is not recommended to use magnesium anodes in salt or brackish water . The result may be an accelerated corrosion rate, which may damage the metal parts of your boat and leave you with no anode protection in a short period of time. The protection of the underwater metal parts on your boat or motor from corrosive electrolytic action is a very real and necessary concern. The use of an activated alloy such as an “anode” will help. Anodes will distract the corrosion action to itself and away from expensive metal parts. Fortunately anodes are relatively inexpensive and are readily available. Factors such as warm water temperatures, polluted water and stray current corrosion can cause your anodes to waste away at an accelerated rate so it is wise to check them on a regular basis. Many people refer to these types of anodes as " ZINCS ". 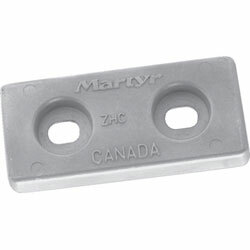 Martyr anodes are made from an "activated alloy"; an alloy in which catalysts have been added to the high purity zinc to ensure that the anode gives 100% of itself in the purpose of protecting your boat from corrosive action. It is this total giving of itself that is the root of the name "Martyr". The complete and active 'giving' of a Martyr anode is your assurance of the best protection you can buy for your boat. What is Electrolytic Corrosion? If you've noticed corrosion on the metal parts of your boat located below the waterline, you are the victim of "galvanic corrosion". The scientific term "electrolytic" or "galvanic" corrosion describes the type of corrosion that anodes are intended to absorb. This corrosion is normally caused by different metals being near each other in salt water. Galvanic corrosion, an electromechanical action, causes metal parts to decompose. This destructive process is caused by electrolysis, an electric current set up between the metal parts of your boat, with salt water as the electrolyte. The effect is like a flashlight battery -- an electrical current is created and continues until one of the metals is eaten up -- the battery goes "dead". We see the eating away on shafts, propellers, rudders, and other fittings and drive parts under the salt water. The results are unattractive, affect operating performance, and cause excessive maintenance of hull, propellers, engine, accessories and fittings. Some metals react more actively than others and will be eaten up first. This activeness is the reason that a steel fitting can corrode away while a brass one next to it will not. Both these parts could be protected, however, by a properly installed Martyr activated alloy anode. The Martyr anode will be eaten away and the steel and brass fittings will be untouched. The sacrificing action of the anode is the reason it is called a sacrificial anode, and the source of the name "Martyr".